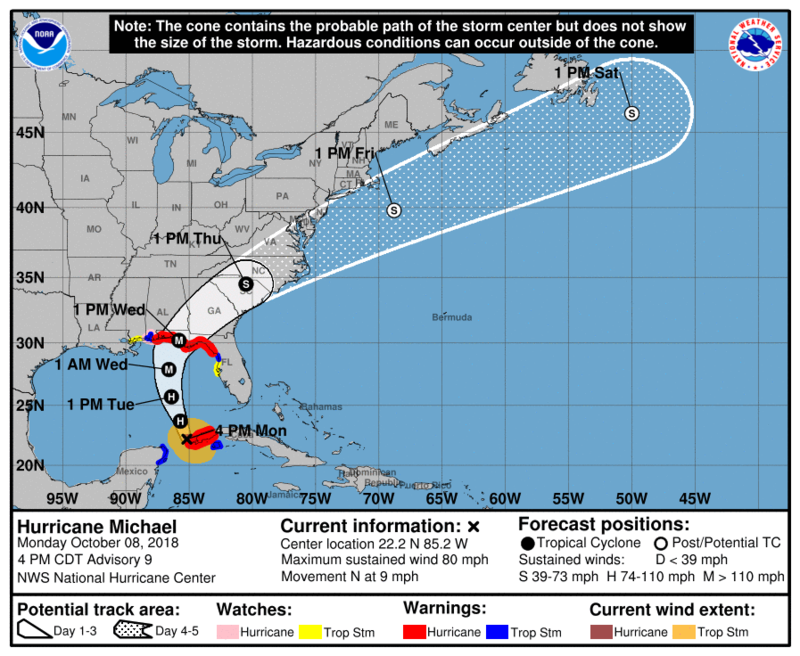 A tropical weather system that rapidly strengthened into Hurricane Michael on Monday is likely to keep growing stronger ahead of an expected strike on Florida’s Panhandle by midweek, forecasters said. Michael could become a major hurricane with winds topping 111 mph (178 kph) by Tuesday night before an expected strike Wednesday on the Panhandle or Big Bend, according to the National Hurricane Center. By 5 p.m. Monday, Michael’s top sustained winds were around 80 mph (130 kph) as it headed north at 9 mph (15 kph). The storm was centered about 30 miles (45 kilometers) off the western tip of Cuba, and about 520 miles (835 kilometers) south of Apalachicola, Florida. Hurricane-force winds extend outward up to 35 miles (55 kilometers) from the storm’s center and tropical-storm-force winds extend outward up to 175 miles (280 kilometers). 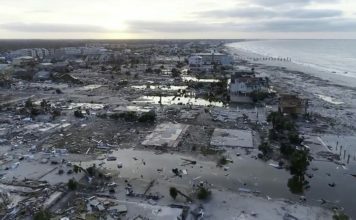 Aside from causing power outages, flooding and property damage, Michael could also worsen a toxic algae bloom that has plagued Florida’s beaches for a year. The red tide in the Gulf of Mexico off southwest Florida that began last October after Hurricane Irma swept up the state has killed massive amounts of marine life and caused respiratory irritations in people. The bloom has spread to Florida’s Panhandle and the Miami area. Tracy Fanara at Mote Marine Laboratory and Aquarium in Sarasota said the algae are “very vulnerable to turbulence” and the bloom could dissipate. 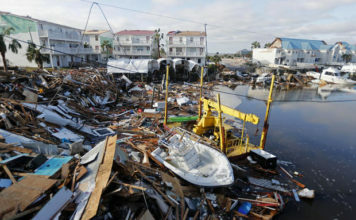 However, Fanara said, Michael’s strong winds also could stir up pollution and nutrients in the water that feed algae blooms. You can read the latest advisory from the National Hurricane Center here.